Tear up the Pierre, hosted by Nicole & Damien Woody, as well as Co-Chairs Mark Sanchez & D’Brickashaw Ferguson of the New York Jets, was an elegant evening of cocktails, hors d’ouvres and a fashion show highlighting a catwalk being graced by some of the best athletes on the planet. This was a fashion show to remember. The prestigious uptown hotel, The Pierre, accommodated guests for a unique fund raising event at its opulent location on the Upper East Side of New York City. 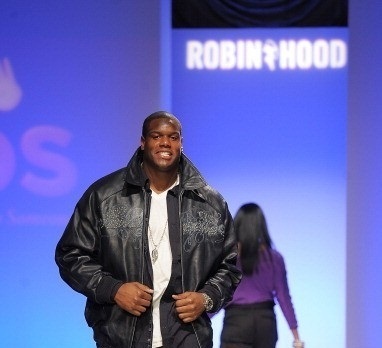 The beneficiaries were right tackle Damien Woody's PROS (People Reaching Out to Someone) Foundation and the Robin Hood Foundation. The entire New York Jets football team found their inner fashionista just long enough to raise quite a bit of money and awareness. The star studded fete was a night to remember and put on in style by LFB Media Group who tapped the party planning talent of Toast. Celebrating the holiday season and New Yorkers in need, the team modeled the latest collections from Sean John, Akoo, Pelle Pelle and Apple Bottoms, live on the runway. With a tremendous amount of energy and good will, the crowd was treated to a spectacle rarely seen. All proceeds raised went towards supporting the Robin Hood and PROS (People Reaching Out to Someone) Foundations.